Santa Maria, Brazil – Fishermen saw a giant anaconda resting in a river and taught it would be fun to poke and pull him out of the water. Their foolish actions gave them trouble the way they least expected. When of them poked the anaconda using a wooden paddle, the disturbed anaconda emerged and tried to escape. 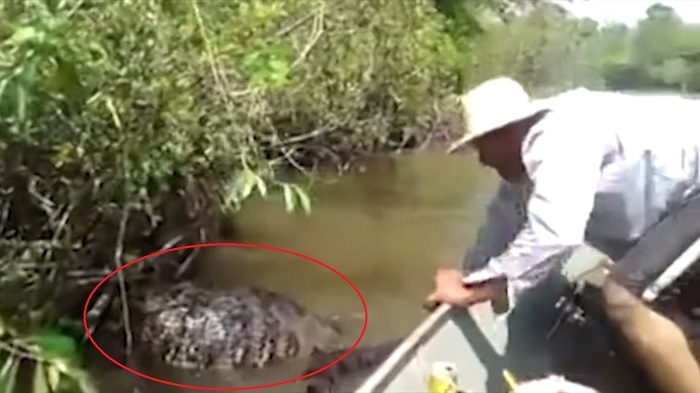 But as the snake tried to swim away, the guy in hat grabbed the anaconda’s tail and pulled it out of the river. For more fun, one of the guy grabbed the anaconda for the second time, where it remains almost motionless for being exhausted. Gladly, they let go of the poor snake afterwards. They were lucky enough the giant anaconda could not take another meal at that moment. But the Brazilian Environmental Authorities were not pleased by their acts and punished them by a $600 fine and a community service.